Looking to buy a gift voucher for the photographer in your life? All of our Photography Courses are available to purchase as gift vouchers. What’s great about buying a photography workshop as a gift is that you don’t have to pick a date now. Just buy a gift voucher, which we’ll email to you, and the lucky recipient can book the workshop on a date they choose. To buy a Photography Gift Voucher, just complete this form with a few details and we’ll email your chosen voucher to you. A comprehensive full day course on using a camera and taking great photos, includes 12 months of ongoing support, eBook and online course access. Take to the streets of London and learn to capture images of places and people. Ideal for aspiring travel photographers. 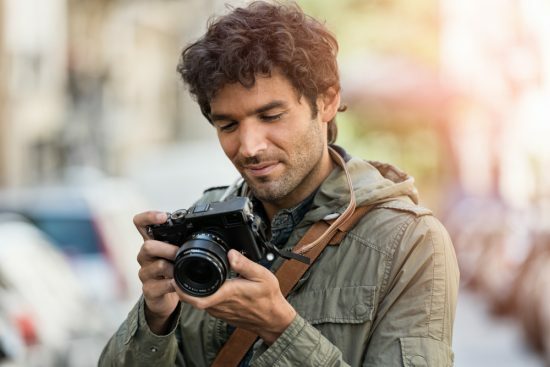 Learn about photography with a one to one session with a pro photographer. Suitable for any level, from beginner to advanced. Short, fun, and educational night photography workshops around London. A half day workshop on improving your outdoor portrait photography skills. Takes place from April to September. Develop wedding photography skills, build a portfolio and learn about the business. Learn about lighting and gain the skills you need to create studio portrait photography. Capture some beautiful images of London during the golden hour and at night. Please enter your details so we can prepare and send your voucher. The dates for our workshops are published on a regular basis throughout the year, so the voucher can be used to book a date that suits. There is always at least one date available to book for each workshop, and if that’s not suitable another date will be published shortly after. Our Gift Vouchers are valid for one year. We can also tailor make a package of courses or one to one training for you. Contact us if you’d like more information on this.